Existing homes sales surged in December, continuing their upward trend with the fourth rise in the past five months. The National Association of Realtors (NAR) reported a 12.3% increase to 5.28 million (seasonally adjusted annual rate) in December, building on the 6.1% increase in November. Overall, from the low of 3.84 million units in July, existing home sales have gained 37.5% in the five months to December. Both single-family home sales and condominium and coop sales contributed to the sharp rise in December, with single-family home sales up 11.8% to 4.64 million units and condominium and coop sales rising 16.4% to 640,000 units. The strong sales growth in December was consistent across all regions, with sales in the West increasing 16.7% to 1.33 million, the Northeast up 13% to 870,000, the Midwest rising 11% to 1.11 million units and the South up 10.1% to 1.97 million units. Despite the strong growth in home sales over the past five months, the inventory of for-sale homes remains high, with 3.56 million units available. At the current sales level, this represents 8.1 months’ supply. While this is a significant improvement on November’s 9.5 months’ supply, it is still well above traditional levels of 4 to 5 months’ supply or a little over 2 million units observed between 1999 and 2005. The parallel NAR practitioner survey indicated that of the existing home sales in December, 33% were to first time buyers, 20% were to investors and the remaining 47% were to repeat buyers. Distressed home sales continue to be a major portion of sales, with 36% of December sales involving a distressed seller. This is up from 33% in November and the 32% share in December 2009. 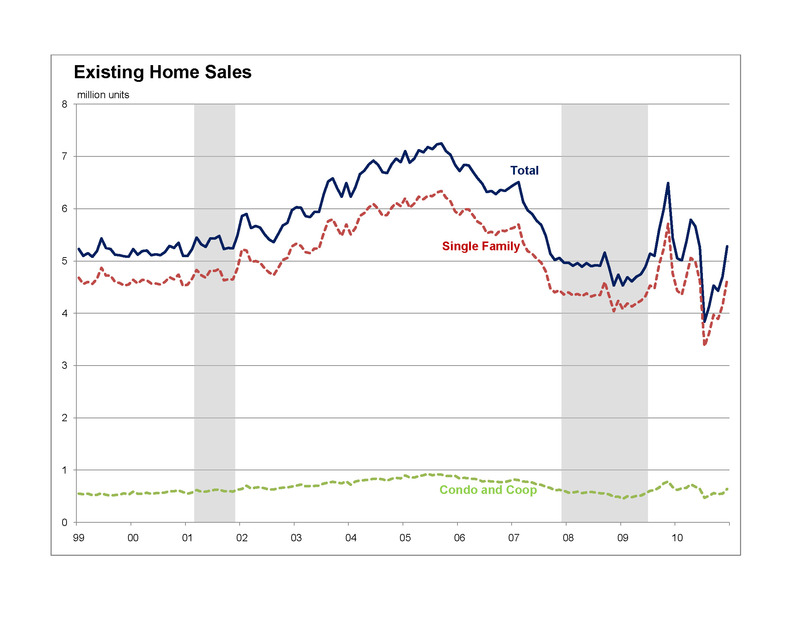 The NAR identify that “The December pace is near the volume we’re [the NAR] expecting for 2011, so the market is getting much closer to an adequate, sustainable level.” The NAHB agree with this assessment, with December single-family home sales, in line with the level we are forecasting for 2011.